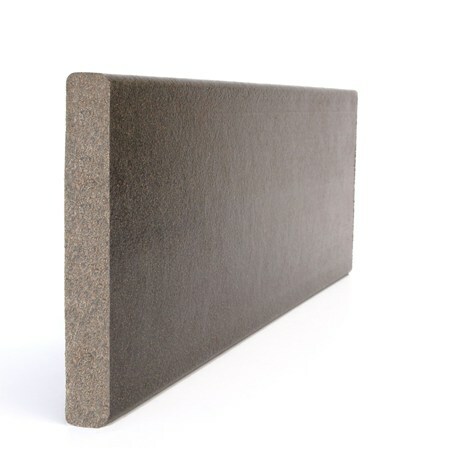 Wood polymer composite (WPC) fascia board, which is manufactured in the UK from a blend of wood fibres and high density polyethylene (HDPE) plastic. A low maintenance alternative to timber, it has been used in a wide range of environments including outdoor dining, leisure areas, balconies and decking. The wood fibres are waste from a timber processor with FSC/ PEFC certification and the HDPE is sourced from recycled milk bottles. Available in a range of colours and lengths, consult manufacturer for exact details. 95% recycled content used in manufacture – 50% wood fibre and 45% HDPE. 5% non-recycled additive content to improve physical, weathering and processing properties. Wood polymer composite is 100% recyclable. Will not splinter, split or crack. A low potential for slip – wet (PTV: 37) or dry (PTV: 58). ecodek® is resilient to changes in moisture, UV light and temperature and is highly suited to external applications as it will not splinter, does not require sanding, nor filling or preservative coatings. Stainless steel, colour coated composite deck screws. Balcony screws, colour coated, designed for use with steel support beams. Wallbarn support pads for use on decking including Mega Pads and TD decking supports can also be specified from NBS Plus. The product information below is from the NBS Plus library of product clauses offered in NBS specification products. It has been created by NBS for ecodek. Each product clause is authored in NBS format and is intended for inclusion in project specifications. Please note that NBS product guidance is not a replacement for the manufacturer's literature and it is recommended that ecodek be consulted before specifying. Negligible fade, retains its rich darkness. Low to medium fade, retains its warm, natural colouring. Medium fade, weathers to a natural hessian colour. Low to medium fade, weathers to silver. Negligible fade, looks black in low light levels.